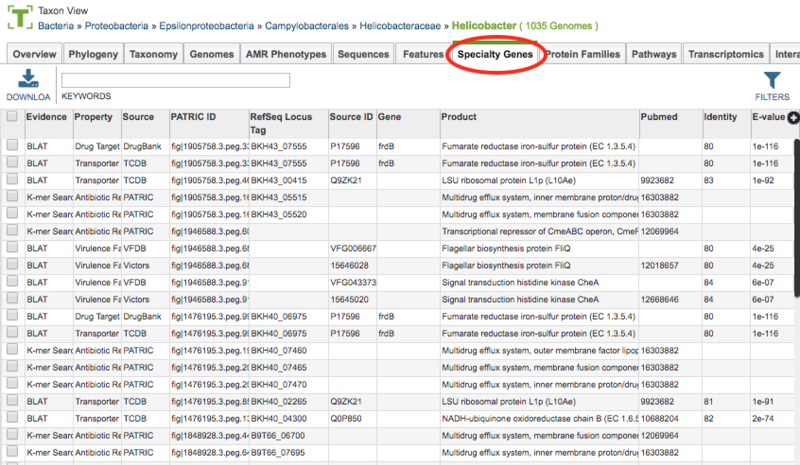 The Specialty Genes Tab provides a table of all the annotated “specialty genes” (virulence factors, antibiotic resistance genes, drug targets, human homologs, transporters, and essential genes) corresponding to the set of genomes in the selected Taxon View level or in the user-defined Genome Group. From this page, features can be sorted, filtered, collected into groups, and downloaded. 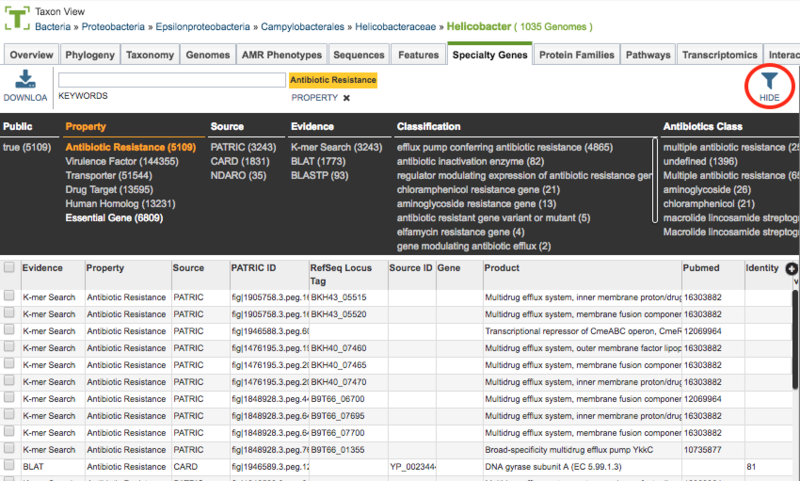 Clicking the Specialty Genes Tab in a Taxon View displays the Specialty table (shown below), listing all the PATRIC features annotated as Specialty Genes corresponding to the set of genomes in the selected taxon level. Antibiotic Resistance: Mapped from CARD, NDARO, and PATRIC-curated AMR genes. Drug Targets: Mapped from DrugBank and TTD. Human Homologs: Mapped from Reference Human Genome at NCBI. Virulence Factors: Mapped from VFDB, Victors, and PATRIC-curated virulence factors. Essential Genes: Mapped to essential genes (using flux-balance for Reference and Representative genomes, predicted using flux-balance analysis. See Data - Specialty Genes for additional information. Rearrange and narrow the list of sequences in the table via sorting (using column headers), keywords (using the Keyword box), and filtering (using the Filters tool). Clicking on the Filters button at the top right of the table opens the Filter Panel above the table, displaying column names from the table and values for those columns with counts of occurence. Clicking on the filter values narrows the features displayed in the table to those matching the chosen filter values. Clicking the Hide button closes the Filter Panel. More details are available in the Filter Tool user guide.